In this study, the relationship between probability of financial distress and market power is examined based on the main industries using data from publicly open firms operate in Turkey, Brazil, and India. Research model includes the variables such as the probability of financial distress, market power, firm specific factors, and macroeconomic factors. The survival analysis, which is newly used in the social science, is conducted at the analysis process using the data period from 2000 to 2014. The findings indicated that there is a statistically significant negative relationship between the probability of financial distress and market power. The probability of financial distress increases with increase in financial leverage. On the other hand, efficiency, profitability, and cash holdings have negative effects on the probability of financial distress. The factors have impact on the probability of financial distress are vary by industries. Aghion, P., Bloom, N., Blundell, R., Griffith, R. ve Howitt, P. (2005). Competition and Innovation: An Inverted-U Relationship. 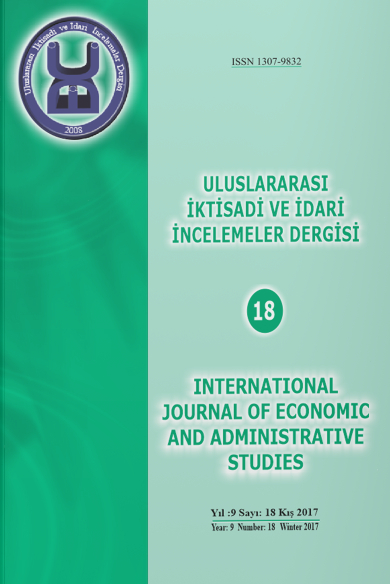 Quarterly Journal of Economics. May, 701-728. Alimov, A. (2014). Does Product Market Competition Discipline Managers? Evidence from Exogenous Trade Shock and Corporate Acquisitions. Asian Finance Association (AsianFA). December 10, 1-46. Altman, E. I. (1968). Financial Ratios, Discriminate Analysis and the Prediction of Corporate Bankruptcy. Journal of Finance. 23(4), 589-609. Altman, E. ve Hotchkiss, E. (2006). Corporate Financial Distress and Bankruptcy: Predict and Avoid Bankruptcy, Analyze and Invest in Distressed Debt. 3. Edition, New Jersey, John Wiley and Sons. Baltagi, B. H. (2005). Econometric Analysis of Panel Data. Third Edition, England: Jhon Wiley & Sons. Beaver, W. H. (1968). Market Prices, Financial Ratios, and the Prediction of Failure. Journal of Accounting Research. Autumn, 179-192. Gujarati, D. N. (2004). Basic Econometrics. Fourth Edition: The McGraw-Hill Companies. Gupta, J., Gregoriou, A. ve Ibikunle, G. (2015). Public vs. Private SMEs: A Comparison of Distress Hazard. The University of Edinburgh. Edinburgh Research Explorer. April, 1-23. Jahur, M. S. ve Quadir, S. M. N. (2012). Financial Distress in Small and Medium Enterprises (SMEs) of Bangladesh: Determinants and Remedial Measures. Economia. Seria Management. 15(1), 46-61. Jensen, C. M. ve Meckling, H. W. (1976). Theory of The Firm: Managerial Behavior, Agency Costs and Ownership Structure. Journal of Financial Economics. 3, 305-360. Keasey, K., Pindado, J. ve Rodrigues, L. (2014). The determinants of the costs of financial distress in SMEs. International Small Business Journal, 1-20. Leibenstein, H. (1966). Allocative Efficiency vs. ‘X-Efficiency’. American Economic Review. June. 56, 392-415. Leibenstein, H. (1973). Competition and X-Efficency: Reply. J. Polit. Econ. May/June. 81, 765-777. Modigliani, F. ve Miller, M. (1958). The Cost of Capital, Corporation Finance and the Theory of Investment. American Economic Review. 48, 261-297. Muzır, E. ve Çağlar, N. (2009). The Accuracy of Financial Distress Prediction Models in Turkey: A Comparative Investigation with Simple Model Proposals. Anadolu Üniversitesi Sosyal Bilimler Dergisi. 9(2), 15-48. Myers, S. C. (1984). The Capital Structure Puzzle. Journal of Finance. 39, 575-592. Ohlson, J. A. (1980). Financial Ratios and Probabilistic Prediction of Bankruptcy. Journal of Accounting Research. 18(1), 109-131. Porter, M. E. (1990). The Competitive Advantage of Nations. New York. Schmidt, K. M. (1997). Managerial Incentives and Product Market Competition. Review of Economic Studies. 64, 191-213. Stigler, G. J. (1976). The Xistence of X-Efficiency. The American Economic Review. 66(1), 213-216. Sektöründe Ampirik Bir Araştırma. Çukurova Üniversitesi İİBF Dergisi. 1, 1-18. Tinoco, M. H. ve Wilson, N. (2013). Financial distress and bankruptcy prediction among listed companies using accounting, market and macroeconomic variables. International Review of Financial Analysis. 30, 394-419.